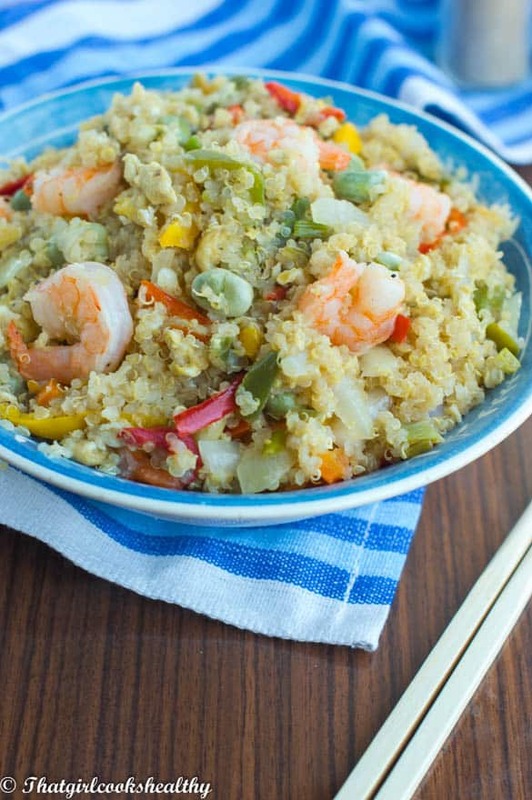 Stir fried quinoa shrimp recipe – cooked quinoa made into a stir fry with eggs, fresh shrimp, broad beans, bell peppers with seasoning. So today we are heading over to the east and I’m treating you all to this east stir fried shrimp quiona shrimp recipe. I know by now you’re probably wondering what on earth is stir fried quinoa? Well this recipe is a grain free adaptation of a popular Asian dish. For some quinoa is on the fence as to whether it should be embraced as the saviour to rice. I’ve read many debates and also factored my own health into the equation. Thankfully I personally have no issues digesting quinoa. However, I realise for some people with IBS, it can damage the lining of the gut and also the paleo philosophy, for the most part doesn’t include quinoa. To put it simply, although quinoa is not a grain, it’s a seed that’s capable of behaving like a grain. Again, this goes back to what I mentioned about this pseudo grain destroying the lining of the gut and seeping into the blooed stream. 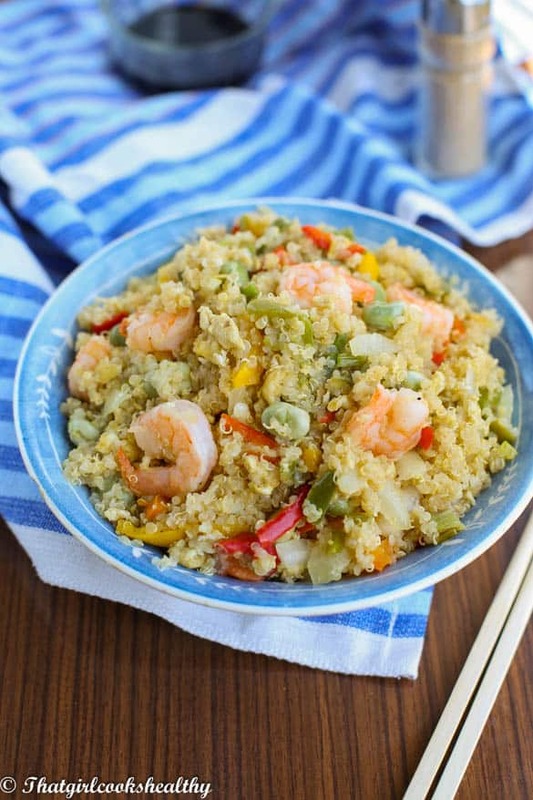 As the verdict is still out on quinoa, some people simply avoid using it and opt for cauliflower rice instead. To make this recipe more paleo friendly you can use cauliflower rice instead using the same measurements and yield the same results. Now that the quinoa talk is covered, let’s discuss the recipe at hand. Well as you already know this is a modern day adjustment to an Asian cuisine. I LOVE making alternative meal plans, I adore the challenge and especially enjoy how great the results are (not all are hits). 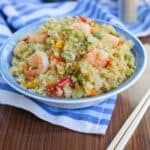 A few things I want to highlight about this stir fried quinoa shrimp, I used broad beans instead of peas, as a personal preference. Also, bell peppers rather than bean sprouts which I know might sound outrageous BUT it totally works. You, of course, can sub the beans and bell peppers or just follow my lead. Also, I added the sesame oil (organic) and prawns towards the end of cooking time and I shall explain why. Organic sesame oil retains many of its nutritional properties (omega fats) when unadulterated. This means the smoke point when cooking will be relatively low and burn very easily (we don’t want that). In order to impart the wonderful flavour of sesame oil, simply, add towards the end or atleast nearest to the end of cooking without compromising nutritional value and quality. Shrimps or prawns as they are known by Britons, should be added lastly, because overcooked shrimp turns tough and rubbery. Believe me, the texture won’t deem fit for an appetising dinner. Try not to reheat the stir fry as this too will increase the risk of the shrimps becoming rubbery. To make a good stir fry it’s always best to cook the quinoa in advance and set side until it’s completely cold…yes COLD. Ever wondered why stir fried rice clumps together? Well using warm, especially wet or heavily lubricated rice/quinoa can cause congealing. 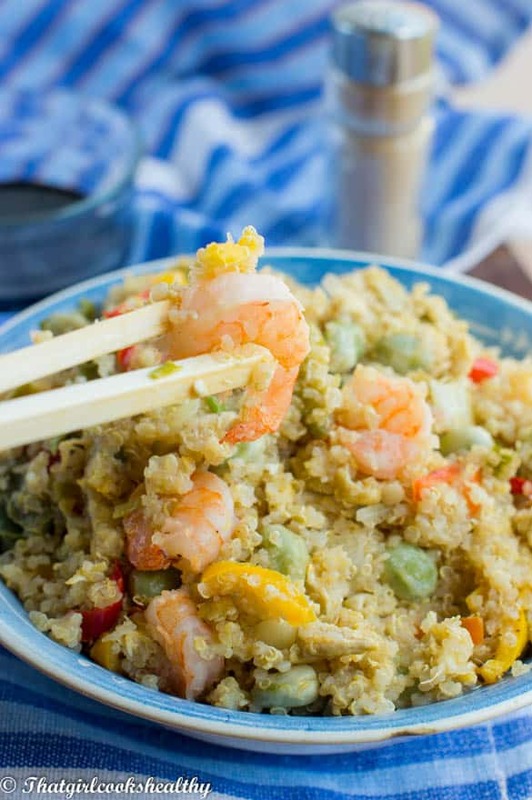 The rest of the stir fried quinoa shrimp recipe shouldn’t be difficult but the instructions at the latter part of the page are here to guide you. Do scramble eggs ahead of time for ease. – in other words prep the eggs ready to add to the stir fry. Some people like to do this simultaneously while sautéing, but I think it would be easier for a novice or just out of convenience to follow my recommendation. I really hope I haven’t overwhelmed you with prep work – do the eggs and quinoa first. Then follow up with the other veggies and I promise you will yield great results. Pour the coconut oil into a wok or wok styled pan on high heat and allow the oil to preheat for 30 seconds. Start to add the ginger and garlic and sautee on medium heat. Given that the oil was preheated on high heat sautee for a few seconds before adding the scallion and continue sautéing. Most of the oil should have absorbed into the ginger, garlic and onion (scallion) mixture, this is normal. Quickly add the bell peppers and broad beans, allowing them to cook for 5- 10 minutes. Despite the lack of oil, they shouldn’t burn in the wok. If they do add a splash more of coconut oil and resume frying until tender. Once the veggies are tender, proceed with adding the quinoa in intervals until all is in the wok and fold into the veggies. Now is a good time to fold in the scrambled eggs, coconut aminos, black pepper and pink salt. Ensure the coconut aminos coats all the ingredients and continue to fry and rotate the wok. Add the onions, again using the folding technique. The idea is to cook them thoroughly not satuee in order to prevent them from shrinking. 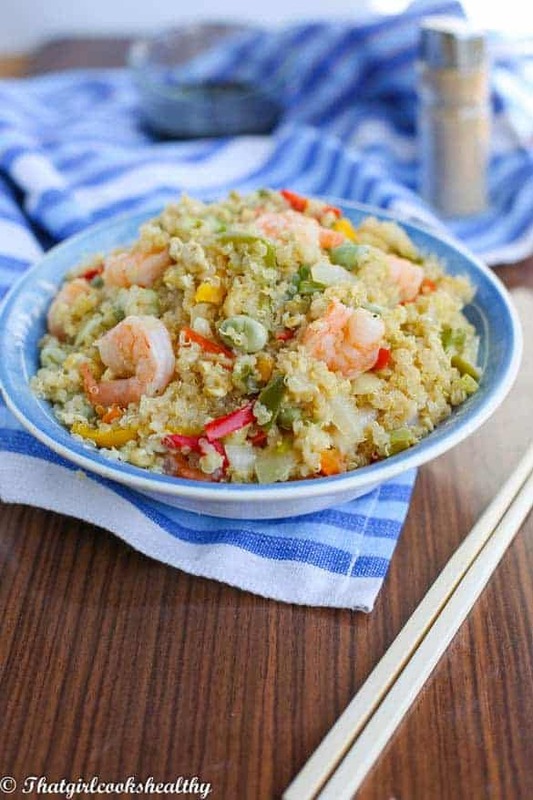 Now add the prawns to the fried quinoa and let them absorb the flavours and heat through – folding and rotating the wok. Half way through adding the shrimp splash the sesame oil over the entire quinoa mix while tossing the food in the wok. First of all, we guessed on what was unclear , and did enjoy your guidance. We’d add more egg next time. I’m an editor by trade. So, when you say to scramble the eggs ahead of time, do you mean cook the scrambled eggs or merely scramble them as prep? Garlic is listed twice as ingredient, Ginger is not a listed ingredient. Step 3 “onion paste,” onions not mentioned in prior steps. Do you mean scallions? Hi JNene. My apologies for the poorly written guidelines. I hope you were still able to complete the recipe and most importantly enjoyed it. I have made the necessary corrections – ginger is now listed, eggs should be scrambled as prep. There is no onion paste, I was referring the the oil absorbing into the ginger, garlic and scallions.